'Thundercloud' is a documentary about the events that transpired on and leading up to the 8th June 2012, when a storm of massive proportions sent a 50ft + swell straight towards the South Pacific archipelago of Fiji. It just so happened that the swell was scheduled to arrive right in the middle of an ASP World Tour event at Cloudbreak, Fiji and very few of the world's best surfers were prepared for waves of that size. A tight knit group of the world's best Big Wave surfers were aware of the forecast swell and converged on the break that the ancient Fijians called Thundercloud Reef. 'Thundercloud' takes a brief look at the history of Cloudbreak, investigates the change of decree that lead to the reefs in the region becoming non-exclusive (meaning anyone could surf there) and hears the accounts of the best surfers in the world that chose to brave the conditions on June 8th 2012.
met in the line up of Cloudbreak after the Volcom Fiji Pro World Tour event was called off for the day. further pushing surfers' limits and imaginations. A day that will be revered as an historic day in surfing, when men faced their fears, raised the bar, rode moving mountains in the South Pacific Ocean and lived to tell their stories. What went wrong in the deadly America’s Cup crash ? Another America’s Cup boat crashed today, this time with fatal results. 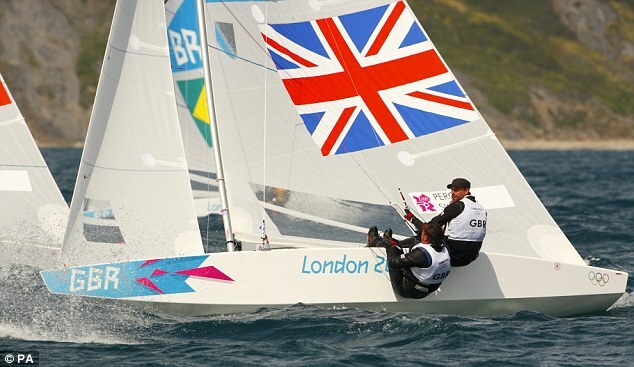 The team is nominally Swedish, but the tactician and CEO, Paul Cayard, is a San Francisco Bay Area native, and his crew is comprised largely of British and American sailors. It was an Englishman who died, Andrew Simpson. Preliminary reports indicate Artemis’s boat didn’t capsize because the sailors were pushing too hard or made a mistake, as was the case with Team Oracle. The problem was with the boat itself, either faulty engineering or faulty construction. The boat simply broke apart under sail, folded, then flipped. The Artemis boat has had a history of cracking and problems with the carbon fiber used in the twin “beams” — the two girders that lash the two narrow hulls together. The boat had been in and out of the shed numerous times in an attempt to correct those problems. Today, however, the forward beam — the girder in front of the sail — gave way during a practice run. The two hulls, no longer connected, began sailing in slightly different directions. This caused one hull to snap just forward of the aft beam, and the mast, held up by high-tension rigging connected to the front of the hulls, simply fell over. The boat began to cartwheel, ultimately trapping Simpson underneath and drowning him. The Oracle crash last October happened in much worse conditions, and in much rougher seas. The team was risking a turn in a twenty-five knot wind, with an ebb tide that was running at six knots. The new America’s Cup boats are powered with a solid wing instead of a soft sail, which makes them very efficient, but it also means that they cannot be de-powered. The turning maneuver in high winds is greatly feared by sailors, who call it the “death zone.” Oracle’s boat was blown over mid turn, landing on its side. In that case, the rigging securing the wing held, and the boat didn’t fully flip, allowing all of the sailors to exit safely. The boat subsequently broke up when it was swept out the Golden Gate by the tide. It is unclear what this latest capsize might mean to the future of team Artemis and, indeed, to the future of the America’s Cup itself. Artemis may have the parts and resources needed to rebuild its boat before racing begins in July. However, Simpson’s death makes it unclear whether the team will continue. The high-powered boats have proved to be crash-prone and, now, deadly. If Artemis pulls out, there would be only two teams left in the playoff series, the Louis Vuitton Cup, which establishes who will challenge Team Oracle for the America’s Cup. If another of these powerful, but new and skittish, boats should crash, it could throw the entire contest into limbo. Today however, has been devoted to eulogizing the sailor who died. “It is with immense sadness that Artemis Racing confirms the tragic death of crewmember Andrew “Bart” Simpson today in San Francisco. Simpson, a British double Olympic medalist, was one of the 11-man crew aboard Artemis Racing’s AC72 catamaran which capsized during training on San Francisco Bay ahead of this summer’s America’s Cup. All other crewmembers are accounted for. “The entire Artemis Racing team is devastated by what happened,” said CEO Paul Cayard. Scientists have discovered a 10-metre-high rock of granite deep in the Atlantic, suggesting a continent may have existed off the Brazilian coast. As granite is usually only found on land, the discovery points to a previously unknown landmass that was swallowed by waves. A member of the Geological Service of Brazil with the rocks dug out from the deep sea bed. 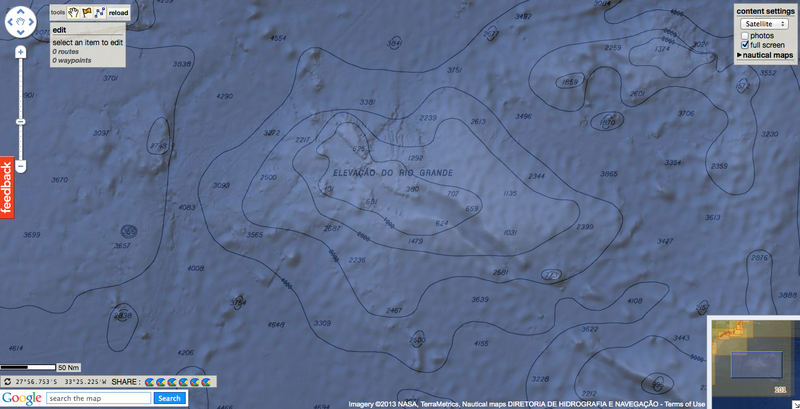 The Japan Agency for Marine-Earth Science and Technology (JAMSTEC) and the Geology Service of Brazil (CPRM) announced Tuesday the discovery of granite at the bottom of the Atlantic Ocean, about 900 miles off the coast of Rio de Janeiro. 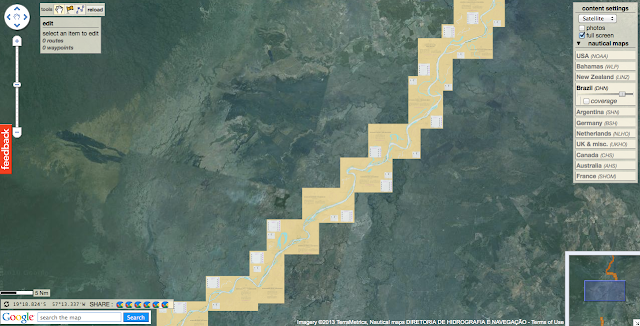 Rio Grande Elevation, a rise on the ocean floor about 1,500 km (932 miles) southeast of Rio de Janeiro, features granite and minerals, including iron, manganese, and cobalt, that differentiate it from the rest of the surrounding seabed. Granite, normally found on dry land, suggests that a continent once existed in the region and then sank, much in the same way Plato described, according to The Japan Times. “South America and Africa used to be a huge, unified continent," Shinichi Kawakami, a professor at Gifu University told the outlet. "The area in question may have been left in water as the continent was separated in line with the movements of plates." Plato wrote that Atlantis was "an island situated in front of the straits which are by you called the Pillars of Hercules," Reuters notes. CPRM geology director Roberto Ventura Santos emphasizes that his team's references to the so-called "Brazil’s Atlantis" are mostly symbolic. "Obviously, we don’t expect to find a lost city in the middle of the Atlantic," Santos said, according to the Telegraph. “But if it is the case that we find a continent in the middle of the ocean, it will be a very big discovery that could have various implications in relation to the extension of the continental shelf." The Shinkai 6500 (しんかい) is a manned research submersible that can dive up to a depth of 6,500 m. It was completed in 1990 and has the greatest depth range of any manned research vehicle in the world. Two pilots and one researcher operate within a 73.5 mm thick titanium pressure hull with an internal diameter of 2.0 m.
Buyoancy is provided by syntactic foam. Three 14 cm methacryl resin view ports are arranged at he front and on each side of the vehicle. JAMSTEC, which is currently conducting a variety of missions and experiments, has been exploring this region in the Atlantic for some time using its state-of-the-art manned mini-sub the Shinkai 6500, the Telegraph notes. On its website, JAMSTEC states its mission is "to contribute to the advancement of academic research in addition to the improvement of marine science and technology by proceeding the fundamental research and development on marine, and the cooperative activities on the academic research related to the Ocean for the benefit of the peace and human welfare." Finding Plato's actual lost city has been something of a holy grail for many researchers and has spawned several unproven "breakthroughs." 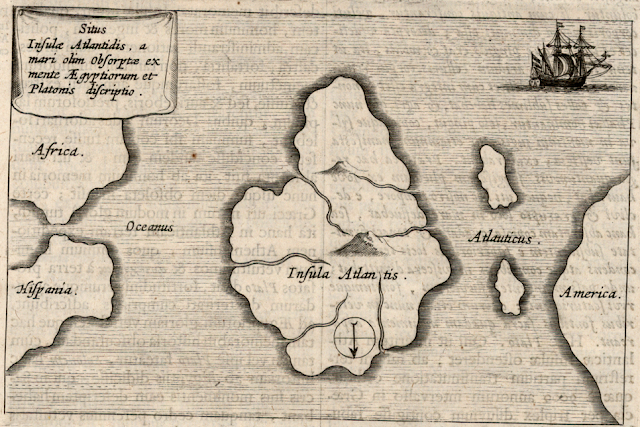 In 2011, a team of researchers claimed to have found Atlantis buried in mud off the tip of Spain. The ancient city was allegedly flooded by a devastating tsunami, according to PopSci. In 2009, a mysterious, underwater grid pattern on Google Earth was also heralded by some as the lost city; however, Google Earth quickly explained it was a glitch created by sonar boat data collection, Time reported. Time-lapse of our icebreaker, the Nathaniel B. Palmer, traveling through the Ross Sea, Antarctica. Two months of sequences, condensed into less than five minutes, with a surprise at the end. A gorgeous new video is the best way to experience Antarctica without even feeling chilly. The time lapse clip, produced and narrated by Cassandra Brooks, a doctoral student at Stanford University, condenses two months on an Antarctic ice-breaker into less than five minutes. Frame by frame, the video reveals how stunning sea ice can be — from polka-dot pancake ice to thick white flows. "It was so beautiful," Brooks told LiveScience. "And it was such a neat experience to be on this crazy boat that was just screaming through the ice." Brooks spent two months aboard the Nathaniel B. Palmer on a National Science Foundation expedition through the Ross Sea of Antarctica. Her team was investigating the release of carbon from phytoplankton blooms, which are so huge in this area that they're visible from space. During the expedition, Brooks also blogged for National Geographic. The time lapse video was inspired, in part, by that blogging opportunity, and also by Brooks' husband, photographer John Weller. "I happen to be married to an amazing photographer who insisted on sending me out on the boat with the right equipment," Brooks said. In this case, that equipment was a GoPro camera and a Joby GorillaPod flexible tripod, which withstood 60-knot (60 miles per hour) winds and negative 40-degree-Fahrenheit (negative 40 degrees Celsius) temperatures, she said. Almost every day, except when the weather was simply too harsh, Brooks went to the bridge of the ship to capture images as the Palmer steered through the Ross Sea ice. The final scenes, though, were filmed from the back of the boat. The Palmer had broken into an area called Cape Colbeck, home to a colony of emperor penguins. Another research group aboard the vessel was tagging the penguins, so the ship remain parked for several days as they did their work. "The longer we were there the more and more penguins came. By the third day we just had it seemed like hundreds, if not thousands, of penguins just playing in our prop wash behind the boat," Brooks said. She got the penguins on film, of course — and captured their raucous, squawking cries as well. "The most amazing thing for me is that every time I go to the Antarctic, I make some sort of blog or some kind of media, and I felt like this is the first time I've been able to capture it well and also really share it well," Brooks said. "It's incredibly rewarding to know that people are really feeling it and probably falling in love with the place." 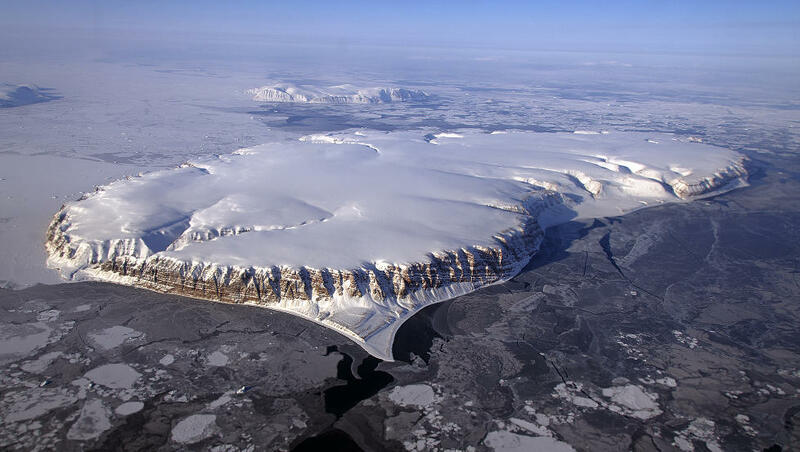 Ice-capped Saunder Island is ringed by a layer of thin sea ice in Baffin Bay. Absorption is particularly fast in cold water so the Arctic is especially susceptible, and the recent decreases in summer sea ice have exposed more sea surface to atmospheric CO2. 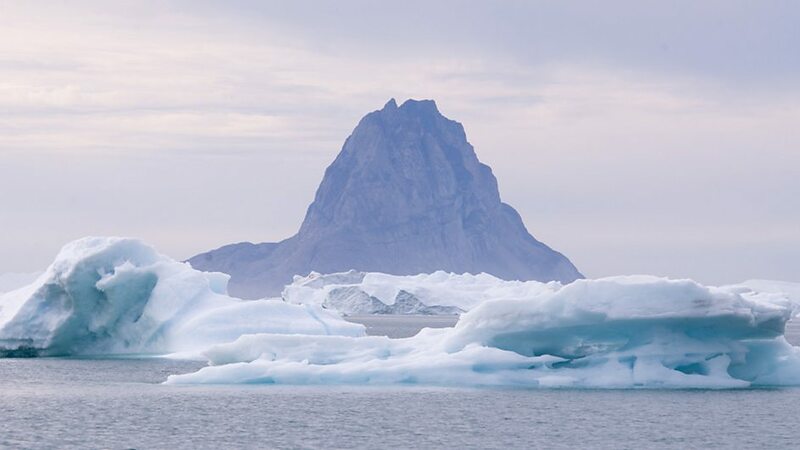 The Arctic's vulnerability is exacerbated by increasing flows of freshwater from rivers and melting land ice, as freshwater is less effective at chemically neutralising the acidifying effects of CO2. The researchers say the Nordic Seas are acidifying over a wide range of depths - most quickly in surface waters and more slowly in deep waters. The report’s chairman, Richard Bellerby from the Norwegian Institute for Water Research, told BBC News that they had mapped a mosaic of different levels of pH across the region, with the scale of change largely determined by the local intake of freshwater. “Large rivers flow into the Arctic, which has an enormous catchment for its size,” he said. This is being made worse, he said, by organic carbon running off the land – a secondary effect of regional warming. “Continued rapid change is a certainty,” he said. The research team monitored decreases in seawater pH of about 0.02 per decade since the late 1960s in the Iceland and Barents seas. Chemical effects related to acidification have also been encountered in surface waters of the Bering Strait and the Canada Basin of the central Arctic Ocean. Scientists estimate that the average acidity of surface ocean waters worldwide is now about 30% higher than before the Industrial Revolution. The researchers say there is likely to be major change to the Arctic marine ecosystem as a result. Some key prey species like sea butterflies may be harmed. Adult fish look likely to be fairly resilient but the development of fish eggs might be harmed. Globalisation, with its ever increasing demand for cargo transport, has inadvertently opened the flood gates for a new, silent invasion. Scientists from the Universities of Bristol, UK, and Oldenburg, Germany, have examined ship traffic data and biological records to assess the risk of future invasions. Their research is published in the latest issue of Ecology Letters. Animals and plants can hitch a ride on cargo ships, hiding as stowaways in the ballast tanks or clinging to the ship’s hull. Upon arrival in a new port, alien species can then wreak havoc in formerly pristine waters. These so-called invasive species can drive native species to extinction, modify whole ecosystems and impact human economy. The risk of marine bio-invasion caused by global shipping around the world. Some regions, such as the San Francisco Bay or Chesapeake Bay, have even reported several new exotic species per year. The knock-on effects to fishermen, farmers, tourism and industry create billions of US dollars in damage every year. Conservationists and ship engineers are now trying to prevent the next big invasion. But without knowing when and where it may occur, their possibilities remain limited. As part of the research project, funded by the Volkswagen Foundation, the team obtained detailed logs of nearly three million ship voyages in 2007 and 2008. Depending on the particular route travelled by each ship, the researchers estimated the probability that a species survives the journey and establishes a population in subsequent ports of call. Although this probability is tiny for any single voyage, the numbers quickly add up because modern cargo traffic volumes are enormous. The final tally reveals the hotspots of bioinvasion. Large Asian ports such as Singapore and Hong Kong but also US ports like New York and Long Beach are among the sites of highest invasion probability. These waterways are notoriously busy, but, traffic is not the only important factor. The North Sea, for example, does not rank among the top endangered regions despite intense shipping. Temperatures here are lower, making it more difficult for alien species to survive. However, arrivals from the other side of the Atlantic pose a serious threat to the North Sea. Most invaders are predicted to originate from the North American east coast. As severe as the risk of future invasions may be, the study also contains a hopeful message. If ship engineers could prevent at least some potential invaders from getting on board, the total invasion risk could be substantially mitigated. By successfully removing a species from 25 per cent of the ballast tanks arriving at each port (eg with filters, chemicals or radiation), the overall invasion probability decreases by 56 per cent. The reduction is so disproportionately large because the effect of ballast water treatment multiplies at successive stopovers. but there are many unknowns about future trade routes. Bioinvasion is, as the researchers admit, a complex process, and records of past invasions are far from comprehensive. Facing these uncertainties, they simulated various different scenarios. Interestingly, the key results are comparable for different models, predicting the same hotspots and global highways of bioinvasion. The traffic on the main shipping routes plays the greatest role for the calculation. For example, the future of the world economy remains uncertain, and Arctic passages may become navigable as a consequence of global warming. Future simulations will also have to take into account which engineering solutions for ballast water treatment will eventually be adopted by port authorities. Paper: The risk of marine bioinvasion caused by global shipping, Hanno Seebens, Michael T. Gastner, Bernd Blasius, Ecology Letters, published online 24 April 2013. The Conversation : Without wetlands, what will protect the Great Barrier Reef?